This interesting surname has a number of origins. Firstly, it may be an occupational name for a fisherman, deriving from the Middle English "fisher", a development of the Olde English pre 7th Century "fiscere", a derivative of "fiscian" meaning "to catch fish". Secondly, it may be a topographical name for someone who lived near a fish weir on a river, deriving from the Middle English "fisch", Olde English "fisc" meaning "fish" plus the Middle English "gere" a development of the Old Norse "gervi" "weir, apparatus". inally, it may be an Ashkenazic occupational name for a fisherman from the Yiddish "fisher". The surname dates back to the mid 13th Century (see below). London Church Records include the marriage of Annis Fisher to Robart Marle on July 6th 1549, at St. Martin Orgar, and the christening of Anne, daughter of Thomas Fisher, on March 8th 1552 at St. Mary Magdalene's, Bermondsey. The name is well represented in the "Dictionary of National Biography" with over twenty entries, one of the most notable being George Fisher (1794 - 1873), who acted as astronomer to the Polar expedition of 1818, and propounded a theory of the nature and origin of the aurora borealis, published in 1834. 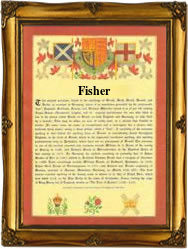 A Coat of Arms granted to a Fisher family in Scotland is a blue shield, with a silver chevron between three silver salmon haurient. The first recorded spelling of the family name is shown to be that of Richard le Fischer, which was dated 1263 in the "Feet of Fines of Essex", during the reign of King Henry 111, known as "The Frenchman", 1216 - 1272. Surnames became necessary when governments introduced personal taxation. In England this was known as Poll Tax. Throughout the centuries, surnames in every country have continued to "develop" often leading to astonishing variants of the original spelling.